Owen Roberts and wife of Repton are the proud parents of twin daughters, born last Saturday. Source: Crittenden Record-Press. (Marion, Ky.) 1909-1918, March 18, 1915, Image 5 - Chronicling America - The Library of Congress. 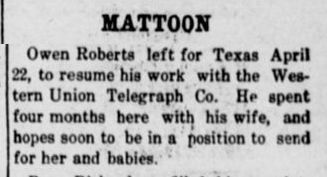 Owen Roberts left for Texas April 22, to resume his work with the Western Union Telegraph Co. He spent four months here with his wife, and hopes soon to be in a position to send for her and babies. Source: Crittenden Record-Press. (Marion, Ky.) 1909-1918, May 6, 1915, Image 5 - Chronicling America - The Library of Congress. Ada, Okla., June 3.--Mrs. Elva Roberts Duvall, of Oakman, has received her appointment as the lady agent for the girls' club of this county. She was in Ada today in conference with Miss Chandler, the state agent, relative to the various phases of the work. It is usually conceded that Mrs. Duvall is one of the best, if not the best, qualified woman in the county for this important position. She has been principal of the Oakman school for some time, and has been brilliantly successful there, in fact, her enthusiasm in the school room, coupled with her ability to handle children and her knowledge of farm life, was responsible for her appointment. Mrs. Duvall has already begun her work. She expects to have some exhibits this fall at the fair that will surpass anything yet seen there. She will be heard from time to time in the Junior Farmer, as the Junior Farmer editor will publish interviews from her.--Weekly News. Source: Crittenden Record-Press. (Marion, Ky.) 1909-1918, July 1, 1915, Image 7 - Chronicling America - The Library of Congress. 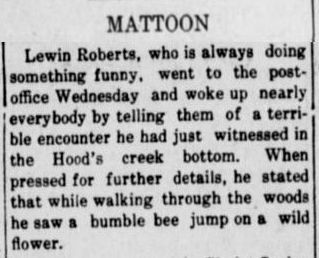 Lewin Roberts, who is always doing something funny, went to the post-office Wednesday and woke up nearly everybody by telling them of a terrible encounter he had just witnessed in the Hood's creek bottom. When pressed for further details, he stated that while walking through the woods he saw a bumble bee jump on a wild flower. Source: Crittenden Record-Press. (Marion, Ky.) 1909-1918, August 26, 1915, Image 2 - Chronicling America - The Library of Congress. 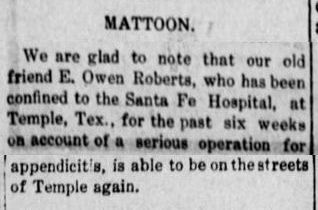 We are glad to note that our old friend E. Owen Roberts, who has been confined to the Santa Fe Hospital, at Temple, Tex., for the past six weeks on account of a serious operation for appendicitis, is able to be on the streets of Temple again. Source: Crittenden Record-Press. (Marion, Ky.) 1909-1918, August 26, 1915, Image 7 - Chronicling America - The Library of Congress. Lewin Roberts left [last] week for the "Golden West." Source: Crittenden Record-Press. (Marion, Ky.) 1909-1918, February 10, 1916, Image 9 - Chronicling America - The Library of Congress. 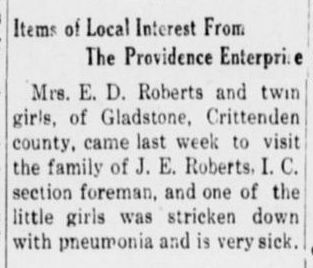 Mrs. E. D. Roberts and twin girls, of Gladstone, Crittenden county, came last week to visit the family of J. E. Roberts, I. C. section foreman, and one of the little girls was stricken down with pneumonia and is very sick. Source: Crittenden Record-Press. (Marion, Ky.) 1909-1918, March 16, 1916, Image 4 - Chronicling America - The Library of Congress. For several weeks I have been thinking of writing you a letter. I left home (Mattoon) the first day of March, reaching Hickman next day found my daughter and family well, I am still visiting here but expect to leave in a few days. This a pretty country now, with nature budding forth into life. My daughter lives about two miles from Hickman; just a lovely drive. The scenery is beautiful, hills and dells, green woods, fertile fields, orchards and gardens dotted here and there with neat cottages and handsome substantial residence. The people here give much attention to truck farming and fruit raising, as Hickman is a fine market for fruit and vegetables. Almost every winter there is trouble here with high water. Last winter the river was so high that it ran over the levee and flooded west Hickman. 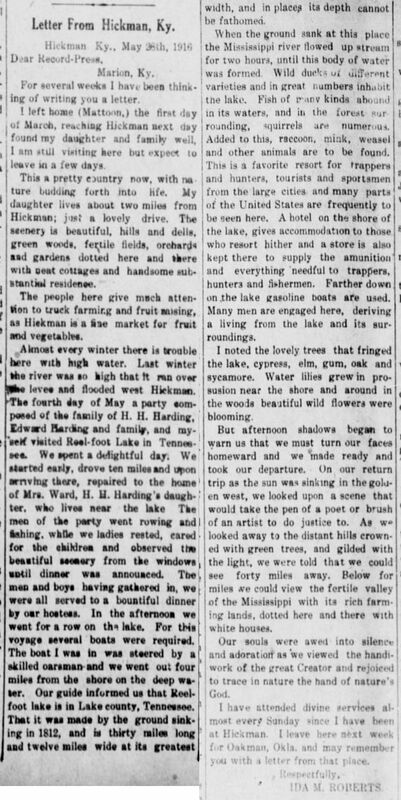 The fourth day of May a party composed of the family of H. H. Harding, Edward Harding and family, and myself visited Reel-foot Lake in Tennessee. We spent a delightful day. We started early, drove ten miles and upon arriving there, repaired to the home of Mrs. Ward, H. H. Harding's daughter, who lives near the lake. The men of the party went rowing and fishing, while we ladies rested, cared for the children and observed the beautiful scenery from the windows until dinner was announced. The men and boys having gathered in, we were all served to a bountiful dinner by our hostess. In the afternoon we went for a row on the lake. For this voyage several boats were required. The boat I was in was steered by a skilled oarsman and we went out four miles from the shore on the deep water. Our guide informed us that Reel-foot lake is in Lake county, Tennessee. That it was made by the ground sinking in 1812, and is thirty miles long and twelve miles wide at its greatest width, and in places its depth cannot be fathomed. When the ground sank at this place the Mississippi river flowed up stream for two hours, until this body of water was formed. Wild ducks of different varieties and in great numbers inhabit the lake. Fish of many kinds abound in its waters, and in the forest surrounding, squirrels are numerous. Added to this, raccoon, mink, weasel and other animals are to be found. This is a favorite resort for trappers and hunters, tourists and sportsmen from the large cities and many parts of the United States are frequently to be seen here. A hotel on the shore of the lake, gives accommodation to those who resort hither and a store is also kept there to supply the ammunition and everything needful to trappers, hunters and fishermen. Farther down on the lake gasoline boats are used. Many men are engaged here, deriving a living from the lake and its surroundings. I noted the lovely trees that fringed the lake, cypress, elm, gum, oak and sycamore. Water lilies grew in profusion near the shore and around in the woods beautiful wild flowers were blooming. But afternoon shadows began to warn us that we must turn our faces homeward and we made ready and took our departure. On our return trip as the sun was sinking in the golden west, we looked upon a scene that would take the pen of a poet or brush of an artist to do justice to. As we looked away to the distant hills crowned with green trees, and gilded with the light, we were told that we could see forty miles away. Below for miles we could view the fertile valley of the Mississippi with its rich farming lands, dotted here and there with white houses. Our souls were awed into silence and adoration as we viewed the handiwork of the great Creator and rejoiced to trace in nature the hand of nature's God. I have attended divine services almost every Sunday since I have been at Hickman. I leave here next week for Oakman, Okla. and may remember you with a letter from that place. Source: Crittenden Record-Press. (Marion, Ky.) 1909-1918, June 1, 1916, Image 8 - Chronicling America - The Library of Congress. 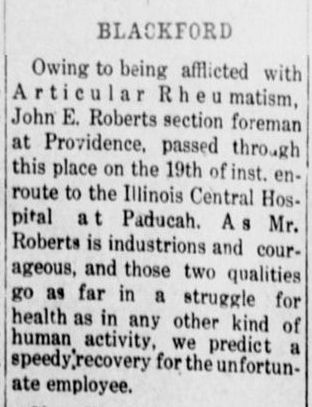 Owing to being afflicted with Articular Rheumatism, John E. Roberts section foreman at Providence, passed through this place on the 19th of inst. en-route to the Illinois Central Hospital at Paducah. As Mr. Roberts is industrious and courageous, and those two qualities go as far in a struggle for health as in any other kind of human activity, we predict a speedy recovery for the unfortunate employee. Source: Crittenden Record-Press. (Marion, Ky.) 1909-1918, June 29, 1916, Image 5 - Chronicling America - The Library of Congress. 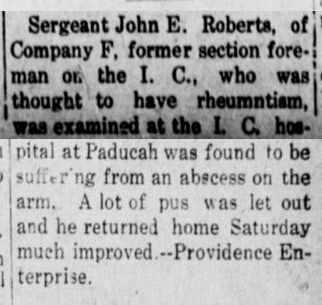 Sergeant John E. Roberts, of Company F, former section foreman on the I. C., who was thought to have rheumntism [sic], was examined at the I. C. hospital at Paducah was found to be suffering from an abscess on the arm. A lot of pus was let out and he returned home Saturday much improved.--Providence Enterprise. Source: Crittenden Record-Press. (Marion, Ky.) 1909-1918, June 29, 1916, Image 6 - Chronicling America - The Library of Congress. 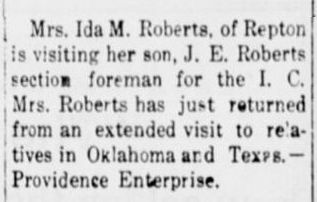 Mrs. Ida M. Roberts, of Repton is visiting her son, J. E. Roberts section foreman for the I. C. Mrs. Roberts has just returned from an extended visit to relatives in Oklahoma and Texas.--Providence Enterprise. Source: Crittenden Record-Press. (Marion, Ky.) 1909-1918, September 28, 1916, Image 2 - Chronicling America - The Library of Congress. 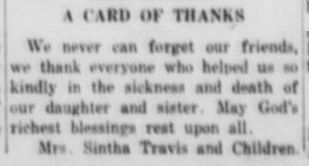 Providence, Ky., Sept. 25, 1916. I left Oakman, Okla., the 30th day of August after spending the summer in that State. I came around by Hickman, Ky., and spent ten days there on my return trip, arriving home the tenth day of September after an absence of more than six months. In greeting old friends almost every one is ready to ask, "How do you like Oklahoma?" Well I like it pretty well. Oklahoma is rapidly advancing to the front. I doubt if any other state has made more advancement in the last few years. It is wonderful to have noted the progress, and to have seen the changes that have taken place even in the last decade. Sections of country that were then sparsely settled with few cultivated fields and rude huts have now given place to fine farms and handsome up-to-date residences. So many towns and cities have sprung up that one is led to wonder how so much could have been accomplished in such a short time. Great interest is taken in educational work and handsome and substantial school buildings are seen in almost every school district. The farmers of Oklahoma have suffered greatly from drought in the past, but they are now studying crops that are suited to grow and produce without so much rain. Diversified farming is being taught. The government has undertaken the task of teaching both men and women on the farm to make the best of conditions both favorable and unfavorable, and to derive from the ground which they till, a living all the year round. Women are being taught to can every vegetable without acids or preservatives--the government way. Even the Indians who have been considered shiftless and improvident are catching the spirit of thrift and enterprise and many of them are now imitating their pale-faced neighbors in the race for advancement and progress. Oklahoma has always been a fine country for raising cattle and this employment still forms one of the most important industries of the State. Traveling from near the center of the state to the southern border I saw some beautiful country. Level prairie farms, with fine pastures and green fields with scarcely a stump or tree in sight, only in the blue distance. In Washita and Red river bottoms the ground is especially rich and fertile. All things considered though, I do not like Oklahoma any better than I do Kentucky. And while I had a nice time there, and expect to return at some future date (if I live) still I confess that as I found myself in the vicinity of home, and heard the names of adjacent towns called out, I leaned forth with pleased expectancy until my eyes rested on old familiar scenes. At present I am visiting my son at Providence. I attended church here last night and heard Rev. King of the Methodist church, deliver his last sermon before going to Conference. He did well, and the truths which he spoke should be sounded forth to all the world. While I have been visiting this year I have striven to improve the time for the Lord. Have attended public worship a number [of] times and have testified to the goodness and mercy of God. Though weak and unworthy, I can say like David of old, "I have praised thy name O God, in the great congregation." Moving around from place to place I remembered the divine injunction, "Sow beside all waters." And not only in public but in private life, I have tried to be an example and walk circumspectly that I might be a blessing and a help to all whom I came in contact with. Source: Crittenden Record-Press. (Marion, Ky.) 1909-1918, October 5, 1916, Image 3 - Chronicling America - The Library of Congress. Mrs. Ida M. Roberts Writes Interesting Letter From Louisiana. Lake Charles, La., Apr. 9, 1917. I have been planning to write you a letter for some time. I reached here a few days before Christmas. I have spent the winter in this city of the southwest. By so doing I have escaped the snows, freezes and bitter cold breezes of my native State. I have seen no snows, and only a little thin ice since I left Kentucky. When I left Hickman, Ky., on the 20th of December last the weather was freezing cold, when I arrived at New Orleans the following day the temperature was about like May, in Kentucky. It is sure a luxury to spend a winter in the Sunny South. People who are born and reared here and lived here all their lives do not now what cold weather is. Well, it seems to me that we have had no winter. Just little cold spells like our Aprils and Octobers in Kentucky. Some children here among the poorer classes, go barefoot all winter. Killing frosts visit this country sometimes, and some of the older citizens remember seeing snow on the ground, but I have conversed with children nearly grown who have never seen any snow at all. The woods now are clothed in foliage like unto summer in States further north. Gardens grew, and flowers bloomed out of doors all the winter. Three crops of garden truck can be grown during the year here. As you know this is the land of sugar cane, cotton and rice. Vegetables do well here I think especially potatoes. Lake Charles, the most important city of southwest Louisiana, is situated fifty miles north of the gulf of Mexico, and the hot summers of this section are rendered more tolerable by cooling breezes from that body of water. Easter here was cool. I attended services on that day at the Catholic church. I have been attending services at the Methodist Church South. Bro. Joiner, pastor. I like the preaching pretty well. I mean to leave here for Oklahoma the last of this month. Expect to spend the summer there with my daughter, Mrs. Elva Duvall. I am sorry that our country has become entangled in war, but I hope the conflict may soon be settled, and that peace may be restored. When I think of our young men going forth to foreign countries to endure hardships and perhaps be slaughtered like cattle it makes my heart ache! I did hope that our land would escape the awful fury and desolation of war that other countries are suffering, but we are entering the conflict and God alone knows what the results will be. We have hitherto been one of the most highly favored nations on the face of the globe, and it may be that in the midst of such great prosperity that the people have forgotten to render unto God what is due. Woe be unto us, if while receiving such bountiful gifts, we have spurned the Giver and closed our hearts against Him. It is awful to contemplate the clashing of nations and the wreck and ruin of war, but how consoling to know that after all, God is ruling and the hand of His guiding providence is directing all things. Come what may, the true child of God has nothing to fear, really. No, not even if nation should be hurled against nation, kingdoms totter on their thrones and tremendous events happen which will hasten the coming of the Son of God. These are days of awful portent, and while our beloved tarries awhile longer, the church of the living God should be in a waiting attitude clothed in spotless white, so that when through the crash and downfall of earthly powers we hear His voice announcing "Behold I come quickly." We may answer back with gladness, "Amen! Even so, come Lord Jesus come quickly." Source: Crittenden Record-Press. (Marion, Ky.) 1909-1918, April 19, 1917, Image 6 - Chronicling America - The Library of Congress. Source: Crittenden Record-Press. (Marion, Ky.) 1909-1918, November 29, 1917, Image 8 - Chronicling America - The Library of Congress. 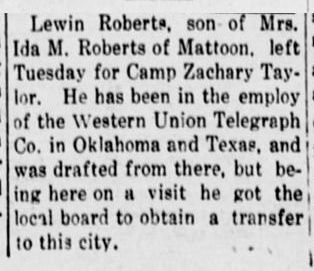 Lewin Roberts, son of Mrs. Ida M. Roberts of Mattoon, left Tuesday for Camp Zachary Taylor. He has been in the employ of the Western Union Telegraph Co. in Oklahoma and Texas, and was drafted there, but being here on a visit he got the local board to obtain a transfer to this city. Source: Crittenden Record-Press. (Marion, Ky.) 1909-1918, August 29, 1918, Image 5 - Chronicling America - The Library of Congress. Born to Mr. and Mrs. Hester Roberts a big baby boy on new year's day. Source: The Crittenden Press. (Marion, Ky.) 1919-Current, January 14, 1921, Image 6 - Chronicling America - The Library of Congress. Mrs. Ida M. Roberts has recently been visiting her sister, Mrs. Louis E. Clift of this section. Source: The Crittenden Press. (Marion, Ky.) 1919-Current, August 12, 1921, Image 3 - Chronicling America - The Library of Congress. 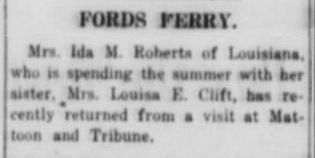 Mrs. Ida M. Roberts of Louisiana, who is spending the summer with her sister, Mrs. Louisa E. Clift, has recently returned from a visit at Mattoon and Tribune. Source: The Crittenden Press. (Marion, Ky.) 1919-Current, September 2, 1921, Image 4 - Chronicling America - The Library of Congress. Mrs. Ida M. Roberts is attending the meeting at Hurricane. Source: The Crittenden Press. (Marion, Ky.) 1919-Current, September 9, 1921, Image 5 - Chronicling America - The Library of Congress. Mesdames Louisa E. Clift and Ida M. Roberts spent Saturday night the guests of Mrs. Bettie Nation of near Repton. Source: The Crittenden Press. (Marion, Ky.) 1919-Current, September 23, 1921, Image 2 - Chronicling America - The Library of Congress. 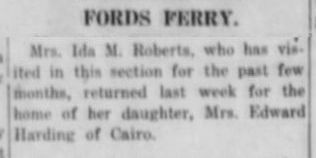 Mrs. Ida M. Roberts, who has visited in this section for the past few months, returned last week for the home of her daughter, Mrs. Edward Harding of Cairo. Source: The Crittenden Press. (Marion, Ky.) 1919-Current, September 30, 1921, Image 3 - Chronicling America - The Library of Congress. Miss Leona Roberts, 18 years old, died at the home of her step-father, Wm. Travis, Monday of tuberculosis. She was buried at Sugar Grove Tuesday. Source: The Crittenden Press. (Marion, Ky.) 1919-Current, March 3, 1922, Image 5 - Chronicling America - The Library of Congress. Miss Lena [Leona] Roberts was born September 4, 1903. She was 19 years, 5 months and 23 days old. 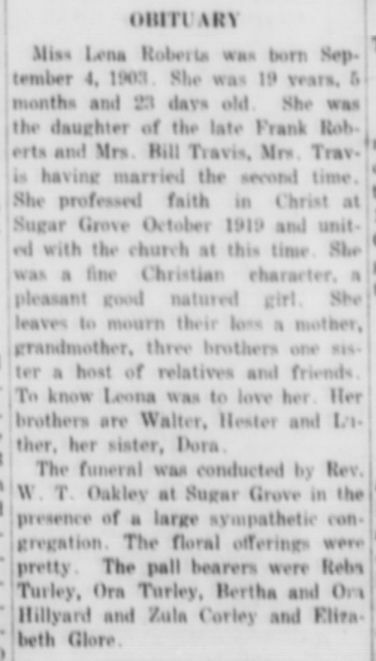 She was the daughter of the late Frank Roberts and Mrs. Bill Travis, Mrs. Travis having married the second time. 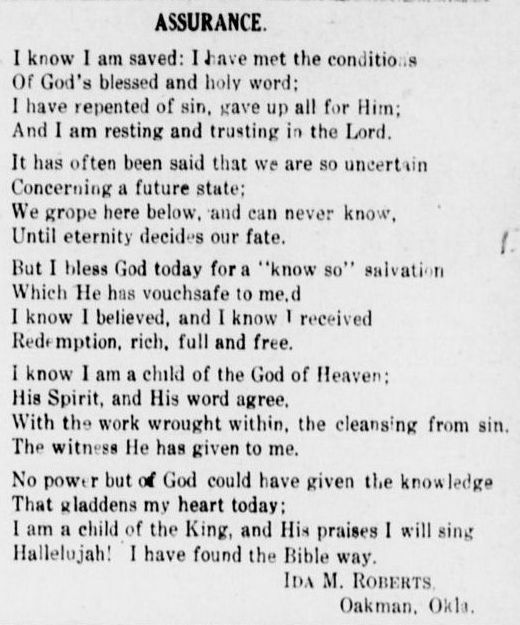 She professed faith in Christ at Sugar Grove October 1919 and united with the church at this time. She was a fine Christian character, a pleasant good natured girl. She leaves to mourn their loss a mother, grandmother, three brothers one sister a host of relatives and friends. To know Leona was to love her. Her brothers are Walter, Hester and Luther, her sister, Dora. The funeral was conducted by Rev. W. T. Oakley at Sugar Grove in the presence of a large sympathetic congregation. The floral offerings were pretty. The pall bearers were Reba Turley, Ora Turley, Bertha and Ora Hillyard and Zula Corley and Elizabeth Glore. Source: The Crittenden Press. (Marion, Ky.) 1919-Current, March 10, 1922, Image 1 - Chronicling America - The Library of Congress. We never can forget our friends, we thank everyone who helped us so kindly in the sickness and death of our daughter and sister. May God's richest blessings rest upon all. Mrs. Sintha Travis and Children. Miss Leona Roberts died at her home in Marion February 27th. Source: The Crittenden Press. (Marion, Ky.) 1919-Current, March 10, 1922, Image 4 - Chronicling America - The Library of Congress.